Shane Shirley : Little Beards? Seriously? Stand with EWG and Send a Reality Check About BPA to Governor LePage TODAY! Little Beards? Seriously? Stand with EWG and Send a Reality Check About BPA to Governor LePage TODAY! This call to action just came into my inbox from the Ken Cook, President of the EWG (Environmental Working Group) Action Fund and I knew this was one I had to share. 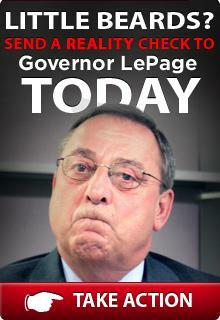 Governor LePage is so misinformed that he is sounding like a moron with his little beards comment. Now I am sure he is an educated man, but when it comes to his knowledge on the harmful, hormone disruption that affects both men and women from using products made with BPA, he needs a little help. Let's stand with the EWG and send a reality check to Governor LePage and help him become educated about the real dangers of BPA to consumers. That way, he can stop sounding like such a fool and do the work that's needed to protect his constituents. Take a look at the following message from the EWG and take action! It's unbelievable that with all that we know about bisphenol A, Maine's Governor Paul LePage is justifying his opposition to banning the chemical from baby bottles by making a lame joke. The Bangor Daily News quotes Gov. LePage as saying: "The only thing that I've heard is if you take a plastic bottle and put it in the microwave and you heat it up, it gives off a chemical similar to estrogen. So the worst case is some women may have little beards." Little beards? Gov. LePage seems to have missed the more than 200 studies linking this plastics component and synthetic estrogen to serious health problems such as prostate and breast cancer, infertility, early puberty and brain and heart disorders. He also apparently missed the research showing serious and lasting changes in the brains and bodies of fetal and newborn test animals. EWG Action Fund plans to send Gov. LePage a reality check regarding information about the latest research on the dangers of BPA. Will you join us? Click here to sign onto EWG Action Fund's reality check made out to Governor LePage, sending him the real science about BPA. Thank you for standing with EWG Action Fund and putting sound science before punchlines.